The last batch of federal employees went without pay on Tuesday. It's Day 25 of the longest-ever government shutdown – with no end in sight to the political standoff. 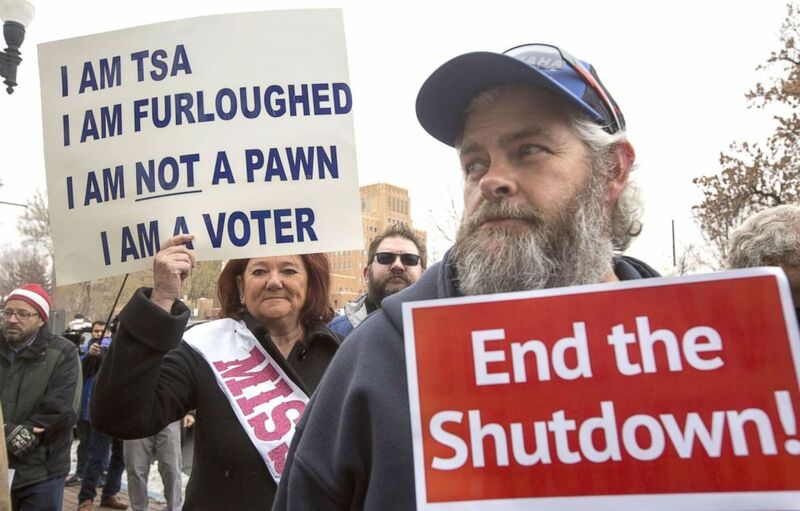 Some 800,000 federal workers are ensnared in the shutdown showdown and many missed their first paycheck on Friday. On Monday, another one-third missed a paycheck, the American Federation of Workers estimated, and on Tuesday, the last batch of federal workers missed theirs – including, for the first time in history, members of the Coast Guard. Here's a look at how different parts of the country are being affected. Tuesday marked the first time members of the armed forces missed paychecks because of a government shutdown. Commandant of the Coast Guard Adm. Karl Schultz issued a stark warning over Twitter: "Today you will not be receiving your regularly scheduled paycheck. To the best of my knowledge, this marks the first time in our Nation’s history that servicemembers in a U.S. Armed Force have not been paid during a lapse in appropriations," he said. In a message to the men and women of the Coast Guard, Schultz also announced some good news: USAA,a financial services company for members of the military and their family, will donate $15 million that will be distributed to the military and civilian workforce in need of assistance. The money will be distributed by the Coast Guard Mutual Assistance and the American Red Cross. "Stay the course, stand the watch, and serve with pride. You are not, and will not, be forgotten," Schultz wrote. Read more from ABC News' Elizabeth McLaughlin. A federal judge on Tuesday denied requests from unions representing air traffic controllers and other employees required to work through the government shutdown that they either be paid or have the option to skip work while missing paychecks. U.S. District Judge Richard Leon ruled to keep the status quo, saying that an order allowing employees considered essential to skip work would be "chaotic" in a best-case scenario and "catastrophic" at worst. Lawyers representing the National Air Traffic Controllers Association had sued the Trump administration to get their controllers, thousands of whom continue to work and just missed a paycheck, be paid while working during the shutdown in order for them to remain "laser-focused" on their job guiding more than 40,000 flights through the nation's airspace every day. Lawyers for the labor unions, including National Treasury Employees Union, argued withholding pay while forcing labor is unconstitutional and violated U.S. labor laws. Leon said only Congress can appropriate the funds to pay federal workers and would not force the Treasury Department to allocate funds to the furloughed employees. The IRS will require some 46,000 employees to work without pay throughout the upcoming tax season to ensure returns are processed and refunds are mailed, the agency announced Tuesday in an updated plan on the government shutdown. That represents almost 60 percent of its 80,000-person workforce. And while the IRS will be adding staff to answer some questions via telephone "in the coming days," the agency said, it's warning Americans to expect "heavier call volume" and "longer wait times." Walk-in assistance centers also will remain closed, including those offices intended to help people who are victims of identity theft and are required to visit an IRS office to establish their identity. Read more from ABC News’ Anne Flaherty. 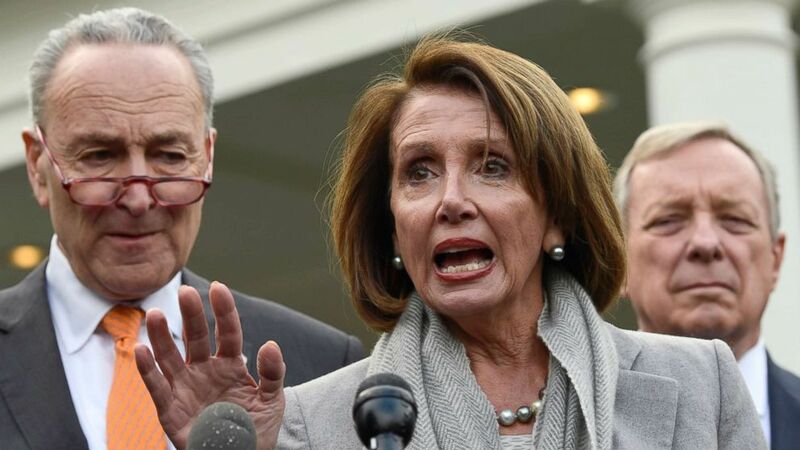 With President Donald Trump and Democratic congressional leaders stalled over talks on a border wall, the president invited rank-and-file members of Congress to meet with him Tuesday over lunch at the White House. But no rank-and-file House Democrats took the president up on the offer. Trump's move was seen on Capitol Hill as an effort to split House Democrats and pressure House Speaker Nancy Pelosi to make concessions in her standoff with the president over funding his proposed border wall. Democratic leaders warned members Trump could use them as props. (Susan Walsh/AP) House Speaker Nancy Pelosi of Calif., center, speaks following a meeting with President Donald Trump at the White House, Jan. 9, 2019. White House press secretary Sarah Sanders said House Republicans invited would be there. “Unfortunately, no Democrats will attend. The President looks forward to having a working lunch with House Republicans to solve the border crisis and reopen the government. It’s time for the Democrats to come to the table and make a deal,” Sanders said in a statement. Read more from ABC News' Jordyn Phelps and Benjamin Siegel. In an effort to keep U.S. airspace safe, the Federal Aviation Administration (FAA) is making a dramatic move and calling an additional 1,700 FAA aviation safety inspectors back to work this week. According to an FAA spokesperson, there were 500 safety inspectors working without pay as of last Friday. With the recall, the number of inspectors will be up to 2,200 by Friday Jan. 18. FAA aviation safety inspectors investigate and enforce safety regulations and standards, which includes inspecting aircraft and related equipment for airworthiness. After proactively conducting a risk assessment, the FAA determined that it was appropriate to recall inspectors and engineers after three weeks of the shutdown, a spokesperson told ABC News. Including the recalled engineers, the number FAA safety employees working without pay by this Friday will total 3,113. The Food and Drug Administration confirmed this week that hundreds of food inspectors will go back to work after the agency missed some routine inspections of high-risk facilities during the shutdown. FDA Commissioner Scott Gottlieb tweeted that about 400 staff were coming back to work, mostly inspectors and support staff that will resume inspecting high-risk food production facilities and facilities that manufacture drugs and medical devices. Read more from ABC News' Stephanie Ebbs. At a hearing held by Democrats on the House Natural Resources Committee Tuesday, witnesses discussed how the shutdown is hurting Native American communities and public lands. While the Indian Health Service is still providing care at its clinics, it is not providing funding to Tribes and Urban Indian health programs during the shutdown, according to the Department of Health and Human Services website. The Urban Indian Health Program consists of 41 separate non-profits around the country that provide health care services funded through federal grants and contracts. Kerry Hawk Lessard is the executive director of Native American Lifelines, a health care provider in Baltimore that falls under the Indian Health Service. Lessard said the lack of incoming money has dire consequences for the already underfunded program, which says on its website they had to reduce services last week because the Indian Health Service couldn't process payments. "Urban Indian Health Programs like Lifelines thus depend on every single dollar we receive in order to combat this systematic underfunding and we're forced to stretch resources to provide services to our patients. Any time there is a lapse in funding or any funding is taken away from UIHPs our facilities and ultimately, our native people suffer," she said Tuesday. "The impact of an Indian Health Service shutdown is that already chronically underfunded facilities are forced to make extremely difficult decisions without any other options. Facilities will not be able to provide care to patients," Lessard added. Food banks around the country near military bases or in cities with a lot of federal government employees have been stepping up to help the furloughed or unpaid workers during the government shutdown. Over the weekend in Washington, a local food bank said 2,200 furloughed federal employees received produce and other items at pop-up locations. In Dallas, a local church is handing out gift cards to furloughed employees. 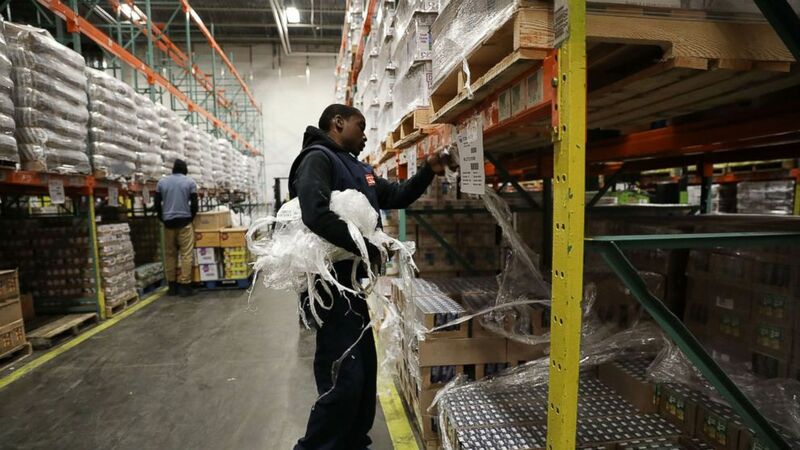 In cities like Tampa, Chicago, Rochester, Minnesota and Ogden, Utah, food banks are setting up pantries or expanding hours so federal employees can pick up groceries or even pet food. (Spencer Platt/Getty Images, FILE) In this June 7, 2017 file photo Employee Shawn Lewis moves pallets of food at the Food Bank for New York City in the Bronx neighborhood of Hunts Point, in N.Y. Dozens of immigration courts remain shuttered across the country this week and tens of thousands of hearings were canceled because of the ongoing government shutdown, a situation that is likely to add hundreds of cases to an already crushing backlog, according to analysts. It's an ironic twist in Trump's desire to secure the U.S.-Mexico border by building a $5 billion wall and send people through established ports of entry. The number of asylum and other immigration-related cases facing U.S. judges has skyrocketed in the past two decades, creating a backlog of more than 800,000 active cases before the shutdown began, according to data compiled by Syracuse University, based on Justice Department records. Syracuse University estimated on Monday that nearly 43,000 immigration court hearings on a variety of matters, including evidence examination and basic scheduling, have been canceled. As many as 100,000 people could be impacted if the shutdown continues through the end of the month. Aaron Reichlin Melnick, a policy analyst with the American Immigration Council, said that he estimates for every day the shutdown continues, another 500 immigration court cases that would have been completed are compounding the backlog. Read more from ABC News' Quinn Owen. Transportation Security Administration officials are closing more security lanes amid increased callouts from officers not being paid during the government shutdown. The absence rate at TSA on Monday was 7.6 percent, up from 3.2 percent on the same day last year, according to TSA spokesperson Michael Bilello. Major airports in cities such as Atlanta and Houston "are exercising their contingency plans to uphold aviation security standards." That means condensing TSA officers into fewer checkpoints and screening lanes to uphold security standards at the cost of longer lines. Queues at Atlanta Hartsfield-Jackson International Airport security extended more than an hour long on Monday morning, causing travelers to miss flights, according to ABC-affiliate WSB. (Natalie Behring/Getty Images) TSA employee Marae Persson (L) holds a sign protesting the government shutdown at the James V. Hansen Federal Building, Jan. 10, 2019 in Ogden, Utah. Airport screeners, air traffic controllers and many FAA inspectors and engineers did not get paid this week despite going to work. ABC News' Jordyn Phelps, Elizabeth McLaughlin, Stephanie Ebbs, Quinn Owen, Jeffrey Cook and Benjamin Siegel contributed to this report.